Dropping Tipping Point and foundation into a hole we’d prepared earlier. 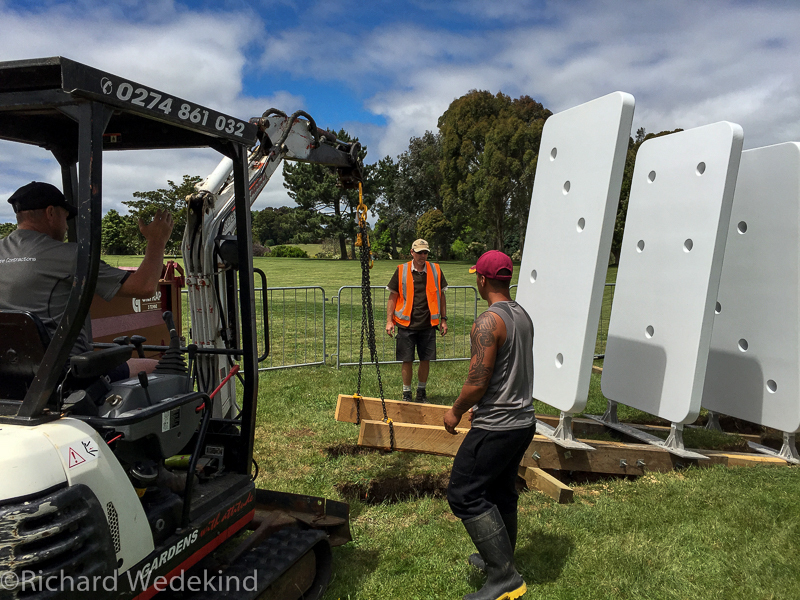 Auckland Botanic Garden‘s biennial sculpture show is about to open – it runs from 29 November 2015 to 6 March 2016. All of the works are now in place and it looks like a pretty good show with plenty of well-known artists represented. This is the fourth time my work has been selected for this event. In what has to have been the easiest installation ever, Tipping Point was placed in position way back on 11 November. Toughening OSH rules mean that work on Council-owned land can only be undertaken by appropriately trained and certified contractors and staff. My role was pretty much reduced to watching and offering helpful comments from the sidelines. Overall a great job by the crew. Tipping Point was crafted in my neighbour’s barn. It did start in my garage, but I quickly worked out that wasn’t going to work. As with most of my work, there is an environmental message. Tipping points and domino theories allude to points where systems become unstable; producing a cascade of unintended consequences that are as inevitable as the last domino toppling. The work is especially pertinent as our minority National government representatives head off to Paris with proposals for meagre greenhouse gas emission reductions and a disingenuous appeal that the small size of our emissions on a global scale mean that we can maintain business as usual. This is a position of moral bankruptcy. What Obama said to Key? President Obama upped the ante on the climate debate in his recent graduation address at University of California, Irvine on 14th June. This follows on from his move to reduce emissions from coal-fired power plants through EPA regulation rather than legislative action. A cynic might point out Obama has started talking tough on climate now the polls are starting to tell him it is safe to do so. In spite of a concerted campaign to discredit the science run by right-wing lobby groups and the fossil fuel industry, Americans who are living through some particularly torrid weather of late, are beginning to realise what they are experiencing is not normal. Scientists are confirming these events are likely driven by a changing climate and this (or worse) is the new normal. Climate change is a real and present danger. Climate change is one of the most significant challenges that our planet faces. The overwhelming judgement of science, accumulated and measured and reviewed over decades, has put that question to rest. Climate change is no longer a distant threat, but has moved firmly into the present. Those who oppose action are out of touch and use short-term political considerations to stymie needed action. Part of what’s unique about climate change, is the nature of some of the opposition to action. It’s pretty rare that you’ll encounter somebody who says the problem you’re trying to solve simply doesn’t exist. Today’s Congress is full of folks who stubbornly and automatically reject the scientific evidence about climate change. There are some who also duck the question because if they admit it, they will be run out of town by a radical fringe that thinks climate science is a liberal plot. The climate change deniers suggest there’s still a debate over the science. There is not. The talking heads on cable news suggest public opinion is hopelessly deadlocked. It is not. Seven in ten Americans say global warming is a serious problem. Seven in ten say the federal government should limit pollution from our power plants. And of all the issues in a recent poll asking Americans where we think we can make a difference, protecting the environment came out on top. These days, unfortunately, nothing is happening. Even minor energy efficiency bills are killed on the Senate floor. And the reason is because people are thinking about politics instead of thinking about what’s good for the next generation. What’s the point of public office if you’re not going to use your power to help solve problems? This is a moral issue. For if we fail to protect the world we leave not just to my children, but to your children and your children’s children, we will fail one of our primary reasons for being on this world in the first place. And that is to leave the world a little bit better for the next generation. The appropriate response to the challenge is to mobilise, stand up to the deniers, divest from the polluters and put this issue firmly on the political agenda to build a low-carbon, clean energy economy. I want to tell you all this not to discourage you. I’m telling you all this because I want to light a fire under you. As the generation getting short-changed by inaction on this issue, I want all of you to understand you cannot accept that this is the way it has to be. We’ve got to do more. What we’re doing is not enough. If you believe, like I do, that something has to be done on this, then you’re going to have to speak out. You’ve got to push back against the misinformation, and speak out for facts. You need to invest in what helps, and divest from what harms. A low-carbon, clean energy economy can be an engine for growth and jobs for decades to come, and I want America to build that engine. You’ve got to remind everyone who represents you, at every level of government, that doing something about climate change is a prerequisite for your vote. It is interesting to note that climate change was among the issues discussed by John Key and President Obama at this weekend’s audience. The track record of our minority National government puts it firmly in the problem rather than solution category regarding climate change and I’m not surprised there was still plenty of time left over to talk about golf. It’s now over a year since we installed our solar panels at Red Cottage and it’s a good time to analyse how successful we have been in reducing our power purchases from Mercury Energy. First to recap, we installed a PV array on our roof in mid-February 2013. It was supplied by What Power Crisis for a total cost of $11,667.85. Our 9 x 250W panels have a theoretical output of 2.25kW, but because the orientation of our roof is not perfect (the panels face NE), there is a consequent loss in efficiency. As can be seen in the daily production chart (below), the day-to-day variability can be up to 4kWh on either side of the 14 day moving average (red Line). On our worst day in April 2103 we generated only 0.05kWh, but our best day in January 2014 saw 15.57kWh pass through our meter box. As there is no power storage on site, any power that we generate over that being consumed is exported to the grid. The purchasing agreement we have with Mercury Energy has them buying power from us at the same rate it is supplied ($0.155/kWh) up to the amount we purchase from them in a given month; any production over and above that quantity is purchased at a discounted rate ($0.035/kWh). Therefore it is more effective for us to use as much of our own power as we can during the day. Energy intensive activities should therefore be undertaken in the middle of the day – a transition that we have not completely adjusted to. We pay normal consumption levies to Vector Limited and the Electricity Authority on power consumed and daily fixed charges to Vector and Mercury as usual. These extra charges mean that we have never had a monthly power bill that was in credit, but having had the Vector dividend from AECT ($330), paid to our power account we have not had to pay a power bill since September and still are in credit. Over the year we bought 2,657 kWh from Mercury and sold them 1,882 kWh. Unsurprisingly, since the panels were installed our power purchases have at least halved in every month – which equates to a saving of $1,167 compared to last year’s power bill. Assuming static power prices, it will take 10 years to pay the system off, but will still have at least another 10 years of life left. Obviously this is a power strategy that requires high up-front expenditure and a long pay-back period that will not suite most consumers. There is more feel-good factor than budgeting sense in this strategy, but it is a good example of the potential to improve energy efficiency and sustainability on a wider scale. Our location in the Hauraki Gulf means that we get plenty of sunshine and this helps to compensate for the inefficient roof orientation of our system, but for new homes where design can be tailor-made for peak efficiency, this is an option that has much merit. We would certainly advocate for increasing pressure/incentives by local and state government to encourage uptake of energy efficiency measures – especially for new housing where measures can be optimised. There has been significant press coverage of the King Tides experienced around New Zealand last weekend. Localised surface flooding of low-lying roads in the Auckland region, particularly the Northwestern motorway and Tamaki Drive have been reported with peak tides up to 0.7m above normal. These King tides are produced when a normal monthly Spring tide (at new and full moon) coincides with the closest approach of the moon to earth. The additional gravitational pull on the oceans associated with the coincidence of these events produces both the highest and lowest tides in a year. The peak tide can be intensified by the weather conditions, but in this case most of the country lay under a high pressure ridge that was associated with calm, sunny weather. As part of an awareness campaign sponsored by Auckland Council, the public were encouraged to photograph King tides around the region and submit them to create a living record of the changes to our coasts and shorelines and a glimpse of what our daily tides may look like in the future as a result of sea level rise. Sea level measured in Auckland Harbour has been rising at a rate of 1.6mm a year over the past century and we are warned to plan for an increase of up to a metre by 2100. This increase is associated with the world-wide melting of glaciers that adds water to the oceans and thermal expansions of the seas as the planet warms. The rise will continue for centuries regardless of any global strategy to combat greenhouse gas emissions. Under scenarios envisaged by NIWA, the high tides observed around Auckland this weekend will be normal by 2060 and it doesn’t take much imagination to contemplate the impact of future King tides that are up to 0.7m above those experienced this weekend. Adaptation to this reality is staring to filter into planning decisions – regardless of what Bill English and Gerry Brownlee might think about climate change. The New Zealand Transport Agency is about to commence a two-year project to raise the height of the causeway on the Northwestern motorway by 1.5m, and other infrastructure projects must surely be under consideration around the country. Auckland Council is also starting to pay more than lip service to the concept of climate change. Although the recently adopted Hauraki Gulf Islands District Plan (HGIDP) only contains a single reference to this subject, the newly proposed Auckland Unitary Plan has significantly improved the portrayal of this issue. Planning maps now define areas at risk from inundation i.e. less than 3m above MHWS and now much of the coastal land around Auckland (except on Gulf islands) is included within Natural Hazard zones. New rules associated with these areas will require all development applications be accompanied by a report by a suitably qualified engineer that confirms that the land on which the activity is located is not subject to the following: a. coastal erosion or inundation over a 100 year timeframe. This strategy follows other local bodies around the country that recognise the risk to coastal communities and explicitly warn of potential impacts associated with climate change. After all it would be inappropriate for Councils not to warn of a clear and present danger that could give rise liability at a later date. The only problem with this planning approach is that adoption of the new Unitary Plan is still several years in the future as the hearings and appeal process will surely significantly delay ratification. Clearly the 10 year cycle of District Plans is too slow and cumbersome to react to risk. Climate change was not on the then Auckland City Council radar when the HGIDP was drafted in 2006, so when the Plan was finally adopted nearly seven years later in 2013, it is in many respects already outdated. It will be another 10 years before the Gulf islands are finally incorporated into the Unitary Plan with its recognition and protections associated with development in at risk coastal zones. 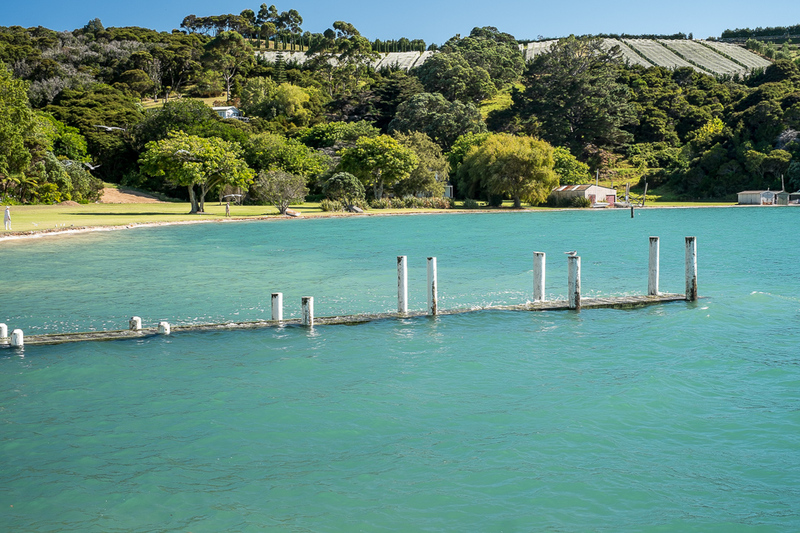 The current situation on Waiheke Island sees Resource Consent applications for residential development within the so-called Coastal Protection Yard, where planners and engineers give no consideration to hazards associated with sea level rise and argue they do not have the tools to do so. While the Resource Management Act clearly states consideration must be given to the effects of climate change in Resource Consent matters, there seems to be a reluctance to integrate this with a Plan that does not address the matter. King tide at Orapiu Beach, Waiheke Island: 9:57am on 2nd February 2014. The grassed area currently has a Resource Consent application under consideration for the construction of two houses and sea level rise is not a consideration in this application. Note person on lawn for scale. Tim Grosser was a bit snippy with reporters when he headed off to the latest round of Climate talks in Warsaw last week. Although government projections have New Zealand’s CO2 emissions continuing to rise for the next decade, he only offered fulsome praise for the reputation of New Zealand in this arena and our overall efforts to reduce emissions. However, it is no surprise to anyone who is following the path of New Zealand’s minority National government, to learn that other observers are less enthusiastic concerning our efforts. 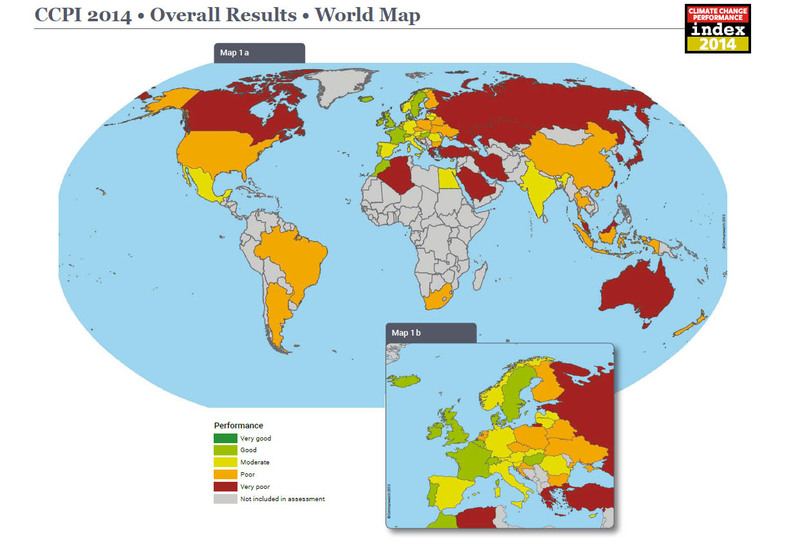 Germanwatch and Climate Action Network have just released their 7th annual Climate Change Performance Index. The goal of this global survey is to highlight those countries with best-practice climate policies and put political and social pressure on those countries which have, up until now, failed to take ambitious action on climate protection. They are somewhat hopeful in their overall analysis noting that the rate of increase for global CO2 emissions is declining, but also make the point that no country is doing enough to prevent dangerous climate change. For this reason none is ranked Very Good and the first three positions in their listing are vacant. Denmark tops the list with a score of 75.23 and is followed by United Kingdom (69.66), Portugal (68.38), Sweden (68.10) and Switzerland (66.17). New Zealand (53.49) has retained its Poor rating falling to 42nd place between Argentina (53.60) and United States (52.93). Australia (41.53) also retains its rating (Very Poor), coming 57th out of the 61 countries assessed. Individual scores are calculated from the assessment of performance in key categories and it is here that New Zealand’s schizophrenic nature is highlighted. We score Good in terms of Development of Emissions and Efficiency, and Moderate in terms of Renewable Energies, but rank among the worst (Very Poor) in terms of Emission Levels and Climate Policy. The National Party’s hierarchy, stacked with climate sceptics, articulates a first follower policy to climate change i.e when China and United States adopt binding measures, New Zealand will quickly follow. They argue that because New Zealand’s emissions are globally insignificant (0.1%) it would by pointless to act unilaterally. What they fail to acknowledge is that New Zealand is already in the rump of recalcitrant nations and falls far below the standards of the majority of nations in this survey. Furthermore U.S. emission appear to have plateaued and many individual states in the U.S. are making considerable progress in addressing climate change. Far from first follower, New Zealand is among the worst foot-draggers and the world is beginning to notice.